You are here: Home › All Aboard the Fairness Express! You may have already seen this big green bus on the road in Nova Scotia, and wondered, “What the heck is that? 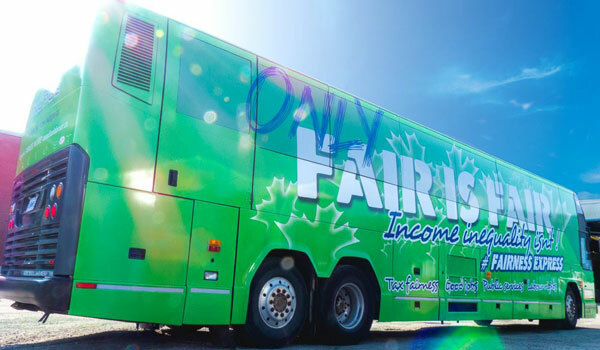 !” Well, it’s the Fairness Express, and it will be criss-crossing the Atlantic provinces over the next few weeks, so we can talk to you and your family about an issue that affects us all: income inequality. If you’d like more information on the Fairness Express, please visit NUPGE’s website. You can also follow the bus virtually by following @ATNcampaign or searching #FairnessExpress on Twitter, or visiting NUPGE’s Facebook page.